JOSHUA 1:8 KJV "This book of the law shall not depart out of thy mouth; but thou shalt meditate therein day and night,..."
5There shall not any man be able to stand before thee all the days of thy life: as I was with Moses, so I will be with thee: I will not fail thee, nor forsake thee. 6Be strong and of a good courage: for unto this people shalt thou divide for an inheritance the land, which I sware unto their fathers to give them. 7Only be thou strong and very courageous, that thou mayest observe to do according to all the law, which Moses my servant commanded thee: turn not from it to the right hand or to the left, that thou mayest prosper whithersoever thou goest. 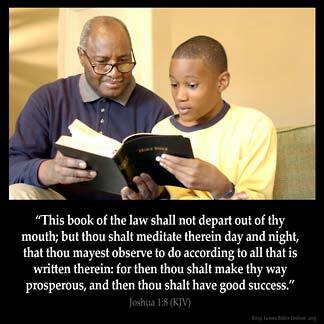 8This book of the law shall not depart out of thy mouth; but thou shalt meditate therein day and night, that thou mayest observe to do according to all that is written therein: for then thou shalt make thy way prosperous, and then thou shalt have good success. 9Have not I commanded thee? Be strong and of a good courage; be not afraid, neither be thou dismayed: for the LORD thy God is with thee whithersoever thou goest. 10Then Joshua commanded the officers of the people, saying, 11Pass through the host, and command the people, saying, Prepare you victuals; for within three days ye shall pass over this Jordan, to go in to possess the land, which the LORD your God giveth you to possess it. This booke of the Law shal not depart out of thy mouth, but thou shalt meditate therein day and night, that thou mayest obserue to doe according to all that is written therein: for then thou shalt make thy way prosperous, and then thou shalt haue good successe. "This book of the law shall not depart from your mouth, but you shall meditate on it day and night, so that you may be careful to do according to all that is written in it; for then you will make your way prosperous, and then you will have success. This book of the law shall not depart out of thy mouth, but thou shalt meditate thereon day and night, that thou mayest observe to do according to all that is written therein: for then thou shalt make thy way prosperous, and then thou shalt have good success. Let this book of the law be ever on your lips and in your thoughts day and night, so that you may keep with care everything in it; then a blessing will be on all your way, and you will do well. This book of the law shall not depart from thy mouth; and thou shalt meditate upon it day and night, that thou mayest take heed to do according to all that is written therein; for then shalt thou have good success in thy ways, and then shalt thou prosper. This book of the law shall not depart out of thy mouth; but thou shalt meditate in it day and night, that thou mayest observe to do according to all that is written therein: for then thou shalt make thy way prosperous, and then thou shalt have good success. This book of the law shall not depart out of thy mouth, but thou shalt meditate therein day and night, that thou mayest observe to do according to all that is written therein; for then thou shalt make thy ways prosperous, and then thou shalt have good success. 1:8 Out of thy mouth - That is, thou shalt constantly read it, and upon occasion discourse of it, and the sentence which shall come out of thy mouth, shall in all things be given according to this rule. Day and night - That is, diligently study, and upon all occasions consider what is God's will and thy duty. The greatness of thy place and employments shall not hinder thee from this work, because this is the only rule of all thy private actions, and publick administrations. Not sure I can say too much more than what everyone else has said. Meditation on gods word is important. It 's more than reading, but reading with a person to discern our Heavenly Father, Jehovah. Some tips for meditation: ask yourself, what does this teach me about Jehovah? Why did Jehovah handle matters in the way he did? What can I learn from this bible account? A deep personal study such as that helps us to draw closer to Jehovah, and that will definitely lead us to a successful path in life. This passage says it all. As I meditate on God 's word and stay in His word daily and keep His word daily and observe to do what His word says : Then He will make my way prosperous and I will have good success : Umph : Evidently all success is not good success unless it is wrought through the Word of God !! The word of God is life to live .It must be meditated on often-And this act creates good success . THE BIBLE SAYS 'THY WORD HAVE I HIDE IN MY HEART SO AS NOT TO SIN AGAINST YOU ' WE AS A CHRISTIAN, WE SHOULD MEDITATE IN HIS WORD SO AS TO MAKE OUR WAY LAWFUL UNTO HIM. SHALOM!! !